All the butterflies in your stomach just died in one single moment. The moment he turned away from you. Every time you try to move on, memories are holding you back. Each and every day is a endless nightmare. You saw him holding hands with someone else like the way you used to do. Pain has just started to spread and your eyes tried to hold the tears. He smiles the sweetest but not at you and things started to lingers in the corner of your mind. It was you before and it's now her. The couch where you used to sit together is so cruel, right? It reminds you how happy you were while talking about the unforgettable moments you've shared. What ifs and if only are running through your head and you think it's your entire fault and you just can't forgive yourself for losing him. and people we can’t live without but have to let go". "Every heart has a pain. while the brilliant hide it in their smile". but it’s even harder to give up when it’s everything you want". than try to hurt yourself putting it back together." Ouch! It seems unfair when all you've wanted is to see that person happy even if letting him go caused you pain. You love that person so much that you chose to live in your dumbest self. You can't just make a person stay in love with you when he doesn't anymore. It will heal, but there will always be a scar". "Some say it’s painful to wait someone. Some say it’s painful to forget someone. But the worst pain comes when you don’t know whether to wait or forget." but they never say what to do when they don't come back." "Don’t feel sad over someone who gave up on you. Who would have never given up on them." How much are you willing to sacrifice just to make the one you love happy? How long can you endure the pain of loving a person whose heart is no longer beating for you? You say you can do everything? Oh yes, everything. What if he doesn’t want to stay anymore? Could you set them free? Would you still hold even if it's too painful for you? Or would you just give up the fight? it takes a while to get everything back together." you begin to understand what little chance we have of changing others. "Pain makes you stronger, tears make you braver, and heartbreak makes you wiser. So thank the past for a better future." If you are going through the hardest part of being heart broken, always remember that it’s only your relationship that has ended and not the world. Cheer up and believe that things will be alright soon. 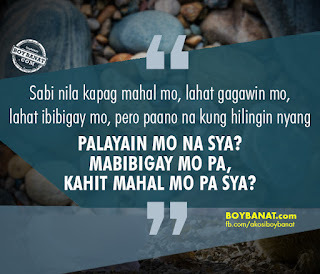 A friendly reminder from the good guy – Boy Banat. How was it? Did you find this post relatable? We have a lot more features to share with you so stay tuned at www.boybanat.com. If you also have your own Tagalog quotes and messages for Broken-Hearted to share, just leave a comment below or you can Contact Us.